•The Bolt R-Spec is stripped down and devoid of chrome parts and epitomizes the “Urban Performance Bobber” look. The compact chassis proudly showcases the 58 cubic inch (942cc), air-cooled, 60° V-twin sitting at the heart of the bike. •The Bolt R-Spec uses modern technology to create a riding experience superior to other similarly sized machines. Even fuel injection and ignition timing maps have been carefully chosen specifically for this bike to deliver class-leading performance with strong low- and mid-range torque sure to bring a smile to every rider’s face. •The Bolt R-Spec’s chassis design is entirely new. Components such as the 3.2 gallon fuel tank, textured seat with colored stitching, remote reservoir rear shocks, belt drive, front and rear wheels, digital meter and steel fenders are new, creating a unique and fresh style. •The slim body and low seat design combine to give the motorcycle light maneuverability and a stable handling feeling. The upright riding posture helps the rider feel the wind, hear the sounds, and experience the pulse of the machine. 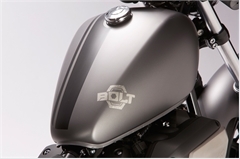 •For riders who value personalization, the options for the Bolt R-Spec are limited only by the owner’s imagination. As we say at Star motorcycles, “we build it, you make it your own.” And as the perfect canvas for customization, Bolt R-Spec is the perfect example of that philosophy. 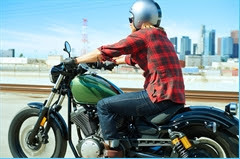 •The 58 cubic inch (942cc) engine is an air-cooled SOHC 60º V-twin with four valves per cylinder, a pent-roof shaped combustion chamber, and 9.0:1 compression ratio. The engine is designed to provide excellent power and superior low-end torque. •To keep friction loss to a minimum and help the engine achieve the ideal performance characteristics, special roller-type rocker arms with needle bearings are used. These also reduce top-end weight for excellent mass-centralization. •The combustion chamber shape was precisely engineered to direct the fuel/air charge to the center of the piston for more efficient combustion and maximum power. Ceramic-composite-plated cylinders provide excellent heat dissipation and reduced oil consumption. •High-quality forged aluminum pistons have a lightweight, high-strength, compact design that contributes to reduced vibration. 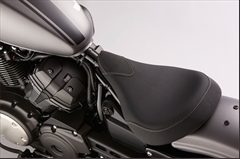 •The stainless steel air cleaner cover provides a “raw metal” look that accentuates the Bolt R-Spec’s distinctive styling. And the air cleaner design helps provide great intake efficiency and enhanced torque characteristics. •A 2-into-1 exhaust pipe layout on the right side of the engine contributes to the lively performance and styling of the machine. The minimalist-style exhaust system delivers a throaty and pleasing exhaust not. •The clutch uses a rubber damper to reduce the fatigue that can come with frequent engagement/disengagement in stop and go city traffic. Riders will certainly appreciate the extra comfort the design provides. 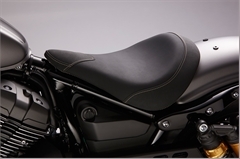 •The low-set seat is a mere 27.2 inches off the pavement, so most riders can easily put both feet firmly on the ground at a stop, as well as enjoy the great riding position the seat provides. •Bolt R-Spec’s short, 61.8-inch wheelbase contributes to the bike’s lively handling, providing for tight turns in city riding and solid handling on the road. •The beefy front 41mm fork tubes offer excellent suspension performance and the twin rear shocks, which include piggyback style gas chambers, have been tuned to provide great comfort and handling while contributing to the machine’s low profile. •At just 21mm wide, the drive belt contributes to the slim and clean look of the rear end. This newly designed belt has a carbon-fiber core which adds strength and durability for longevity. •Newly designed 12-spoke cast wheels are used to provide strength and toughness. Bridgestone® 100/90-19 size front and 150/80-16 size rear bias-type tires help provide excellent road grip. •The 298mm front disc brake and 298mm rear disc brake both use wave rotors, the style usually found on sport bikes. 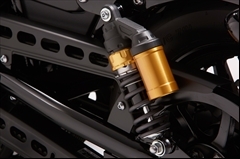 The front brake uses a floating-mount for great heat-distortion resistance, contributing to excellent braking performance. •The 3.2 gallon fuel tank is a traditional teardrop style, with a slim shape that includes flattened top and side surfaces to enhance Bolt R-Spec styling. •A round, smoked-lens LCD digital speedometer adds to the modern take on the traditional bobber style. •LED rear taillight looks cool and adds to the modern bobber appeal. •Steel front and rear fenders are ideal for personalization, including paint and customization.